The fruit of being in His presence and encountering Him in an intimate way - one of the fruits of that is losing your fear of the future, because you so totally trust Him. He's so trustworthy and He proves Himself to you over and over again. Are you willing to look through the eyes of the Holy Spirit at those spots, wrinkles and blemishes? And I thought about that for a while, and it came to me: you know, wrinkles take time and pressure to build up in fabric. They are deep, ingrained habit patterns. They look innocent enough on the outside, but they mar the regal, flowing garments of a Bride. Wrinkles mess up a dress, they break the lines up. And, habitually sleeping in your wedding garment, or sitting when you should be standing and serving is going to create a lot of wrinkles. So, when the Lord said He's coming for a Bride without spot, wrinkle or blemish, I think it's worth taking a look at what those things are. We just talked about wrinkles. Spots occur with our interaction with the world. Have you ever been dressed really nicely - when I live in NYC, standing on a corner when a cabby goes flying by through a mud puddle....whoosh! you've got mud spots all over what you are wearing. Well, in the old southern adage, when you play with dung long enough, you're bound to get some on you. Well, that's what the world is like. If you play around in the world long enough, you start to have the soil of that interaction on your soul. And it gets in the way of your purity of heart, because you're thinking about these things that have to do with the world instead of just thinking about the Lord and what's important to Him. Blemishes are another story - blemishes are deep. A blemish in a piece of fabric would be threads missing from that fabric that would cause it to unravel. In our body, blemishes have to do with impurities in our blood. So, without spot, wrinkle, or blemish, without interior pollution without structural weakness. Things that are hidden, but are highly important. Those are blemishes. As you know, in the Temple sacrifice, the Jewish people never offered a blemished lamb. It had to be an unblemished lamb or and unblemished dove. The offering had to be unblemished in order for the Lord to accept it. That's what He's telling us about our wedding dresses. They can't have spots or wrinkles, and they can't have blemishes. 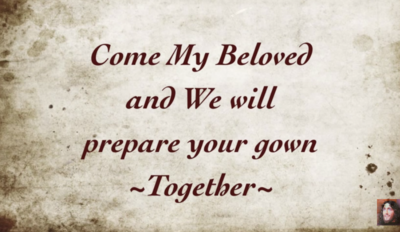 And He's so into preparing us and preparing this wedding garment for us, and purifying our hearts and our minds. And making this garment without spot, wrinkle or blemish. We have to be willing to look at what we might be doing to stain it.